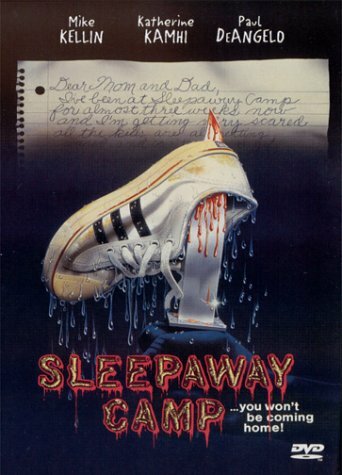 Because SLEEPAWAY CAMP is generally considered to be somewhat of a cheap FRIDAY THE 13th rip-off. But the ending is what makes this cult-favorite so special. Not too long ago, someone told me “The ending is not scary”. Well, it’s not supposed to be. The purpose of this shot – like most of these endings – is to shock, not scare. Not only does it work on that level, it also provides us the final twist of this little 80′s slasher-gem. Yes, curl up with fright or ravish in delight, because our beloved Angela not only turns out to be the killer; she also turns out to be… a boy! The way Robert Hiltzik builds up the tension to that final freeze-frame shot works very well (that final flash-back scene not even included). When Angela stands up and drops the severed head (that’s another extra shock-value thrown in the mix there), Hiltzik uses one slow, back-tracking travel-shot to reveal the horrific truth to the matters. But before the camera reaches that point where you can finally see the naked truth, he cleverly starts inter-cutting two shots of the witnessing couple (already showing their terrified reaction, without actually saying the final twist already) and one close-up of Angela’s growling face. Hereby postponing the actual, widely framed shock-shot for several seconds. When the truth finally is confirmed – in a final graphic and visual manner – the couple even spells it out one last time. To extend the shock-effect, we are treated to one more full-body shot of Angela and the numbed reaction of the couple, before we are finally presented our final frozen frame, slowing turning into screaming green shock-o-vision. Now, on a technical level, this ending has more than one short-coming. At least it used to have. Granted, the slowly zooming out back-travel shot is superb, but the inter-cut shots of Angela’s face don’t exactly match the full-body shot for 100%, since the film-makers apparently used a full-sized puppet to reveal Angela’s secret in the wider shot (at least that’s what it looks like). 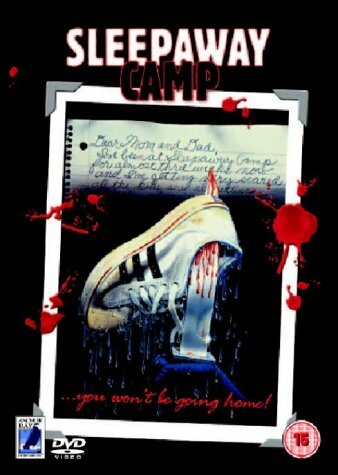 The VHS rental versions of SLEEPAWAY CAMP, released during the 80′s even has serious goofs during its notorious ending. In fact, you practically have to close your eyes in order not to spot them. Angela’s supposed to be naked in that final scene, but during the medium close-up shots (including the final frozen frame) you can clearly see her breasts are covered with a red bathing suit, as it is visible at the bottom of the screen. During restoration, the film’s original aspect-ratio was respected, so the red cloth is no longer visible in any DVD-version of the movie. 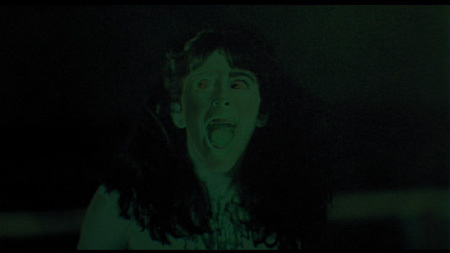 Original goofs or not, the shock-ending of SLEEPAWAY CAMP remains a classic. The kind of classic that you will never forget once you’ve seen it. You simply can’t.